57 Ynyswen, Penycae, Upper Tawe Valley, SA9 1YT. Born New York, U.S.A. 9th April, 1961. Educated in UK and USA. North Oxfordshire School of Art, Banbury, Oxfordshire, U.K: Art Foundation Course. Resin/Fibreglass abstracted figure sculpture with Ron Wood, Cornwall, U.K.
Exeter College Of Art and Design, Devon, U.K. and Boston University, Program in Artisanry, Boston,Massachusetts, U.S.A. Ceramic sculpture, printmaking, figure/portrait drawing and sculpture. Assistant to Richard Hirsch, Professor of Ceramics, Boston University. Sculptures shown and sold in group and solo shows through private and public Galleries in Italy, Malaysia, the U.K. and U.S.A. Sculptures held in Private Collections across the world and by the National Parks and National Trust in the U.K. Studio work with local potters, clays and traditional techniques in Camerota, Southern Italy. Artist in Residence, San Peng School, Kuala Lumpur. Exhibition in American Ambassador’s Residence, K.L. Built 15’x9’Dinosaur in polystyrene for main display at International Furniture Exhibition, World Trade Centre,K.L. Director and Instructor, Adult Pottery and Sculpture classes, Library Art Centre, Newport, New Hampshire. Ceramics Director, Summer Camps in New England; Designing and leading new programs for 7-16 year olds for 12 years. Instructor, hand-building in clay for an outreach program to state schools and special-needs units in Durham, North Carolina. Supply art teacher in New Hampshire state schools. Member of The League of New Hampshire Craftsmen. Established Osprey Studio making sculpture, pottery and providing ceramic services and tuition with particular interest in groups with unusual needs. Developed new pottery and sculpture program for the Ace Centre, Chipping Norton Community Education Council, Oxfordshire. Expanded the services of Oxpots Community Pottery, east Oxford, at the request of Bloomin’ Arts and Oxford City Council; provided classes for Probation Services, the Warnford Hospital (Mental Health and Head injuries), MIND, a Woman’s Refuge and local adults and children. Outreach Tutor for ITHACA: working with special-needs groups like the Gemini Project for Schizophrenia making garden sculpture for a public exhibition. Artist in Residence twice for Oxfordshire Arts Week making large sculpture with children for their schools. Community Artist for OOMF, Oxford’s Millennium Festival (one of the U.K.’s largest) leading all sorts of groups, from firemen to learning disabled Youth Clubs, in building huge sculptures from willow-withies and sellotape for a massive parade and performance. Relocated Osprey Studios to Blaencwm, Rhondda in 1998. Tutor for Adult Education in Pontypridd: drawing, glass-painting and watercolour painting. Member of South Wales Potters. SWP Garden, Brecon Beacons National Park. Top section by Rebecca Buck. 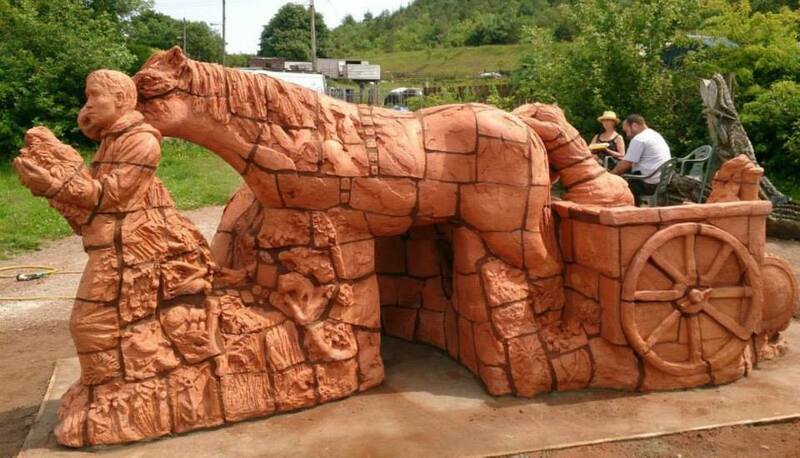 Developed new technique for monumental brick-clay sculpture. Built the ‘Friends’, ‘Equinox’ and ‘Wildlife’ public sculptures in Pen-yr-englin, Rhondda Valley. Established the Sculpture Studio for the Creation Development Trust, Blaengarw, an open art-space for the community. Parc Calon Lan, Blaengarw, South Wales. Built 4 public sculptures in Blaengarw with people from the Sculpture Studio: ‘Calon Lan’ for Parc Calon Lan, ‘Ocean Colliery’ and ‘Balarat Colliery Pit Markers’ and the ‘Balarat Arch’. Between us, we worked out a very inclusive method for genuinely involving communities in making their own Public Art Work. Ocean Colliery Pit Marker, Blaengarw, South Wales. Balarat Pit Marker, 6m L x 2m H, Blaengarw, Wales. Working with Groundwork Trust Rhondda and Merthyr Tydfil, built public sculpture for the communities of Maerdy, Llanharran, Ynysybwl and Cefnpenner. Cefn Penner Dragon designed with the local Youth Club. Lead Sculptor working with community members on The Calon Lan Garden at The Feel Good Factory for the Bryncynon Strategy. Collaborating with people at the ARC Centre, Bridgend to make the entrance feature sculpture ‘Experience’. Experience, ACE Centre, Bridgend, Wales, UK. Osprey Studio moved to a larger premises in the beautiful Upper Tawe Valley, 2011. Working with Time Banking Wales and local people in Tredegar built The Sirhowy Wyvern for The Village Green Park, Sirhowy and a garden sculpture for the Community House in Cefn Golau. The Sirhowy Wyvern, Tredegar, South Wales, UK. Designed and built with Sirhowy residents. Signature sculpture, made with Pupils, to stand in front of the new entrance to Ysgol Maesydderwen, Ystradgynlais, Swansea Valley, 2012. Ysgol Maesydderwen sculpture, Ystradgynlais, Wales, UK. ‘Memorial to Emily’ relief panel for the Story-teller’s Chair in the sensory garden at Llys Caradog Children’s Respite Centre, Llanelli, 2013. Llys Caradog Story Telling Chair and Sensory Garden, 2013. Ystradgynlais Library sculpture designed with pupils at Ysgol Maesydderwen, Ystradgynlais, Wales, UK. Yma a Nawr Sculpture, designed with primary school pupils, residents and staff at Gwalia Mynydd Mawr Nursing and Residential home, Carmarthenshire, 2014. Opening Yma a Nawr, the culmination of a 2 year, multi-artist project working with school children, people with dementia and the staff at Gwalia Mynydd Mawr Home. Invited to join Cavin-Morris Galley, New York, USA. 2015. Sculpture collaboration with Llanelli Youth Group for their community garden, Carmarthenshire, 2016. Lead Creatives project with Pennard Primary School, Gower: play-form sculpture and story, 2017. The sculpture is set facing the rising sun in a circle of established deciduous trees across from a big castle ground-work playform in the far corner of the huge play-ground at Pennard Primary School. This area is often used as an outdoor classroom and is a wonderful, magical, sheltered spot for free imaginative play. great CV and artists statement. the only extra thing I would have liked would have been a resume of your statement on this page without having to click onto the link?